Recommendation If you are looking for a lightweight double stroller then you should look no further because the ZOE XL2 DELUXE Double Xtra Lightweight Twin Travel & Everyday Umbrella Stroller System could be the best stroller model and brand for your family. Convenience-wise it is ultra-light, boast of a one-step fold system, and is very compact perfect for travelling and errands! It is also super easy to use and set up, and has a large under seat storage that comes in very handy for shopping trips. It is definitely a good buy! The ZOE XL2 DELUXE Double Xtra Lightweight Twin Travel & Everyday Umbrella Stroller System is the perfect stroller for families who travel a lot, and those who live in an urban and fast-paced city. It is ultra-lightweight, super easy to use and set-up, has a one hand fold mechanism, and has a great storage space perfect for strolling, errands, traveling, and even shopping. This double stroller is also convenient to use even on public transportation as it is very light and it folds up easily. So whether you are in the airport, will be taking the train, subway, a bus or even a taxi cab, the ZOE XL2 DELUXE Double Xtra Lightweight Twin Travel & Everyday Umbrella Stroller is the best stroller for you in the market. Most families who recommend the stroller rave about its super-wide four-panel canopy that protects children from harsh and suddenly changing weather. This means more than enough shade during the heat of the summer, and enough protection during the monsoon and snow fall season. Moreover, babies and younger children are also bound to remain comfortable while riding this stroller considering the fully padded seats, five point harness system, and seats that are wide enough to accommodate their movements. The seats also recline independently of each other such that even if the kids differ in age, both will remain comfortable during the whole ride. And although this super lightweight stroller weighs at a comfortable 16-pounds, the materials used in the stroller are high quality and very durable, such that it is very stable and does not tip over easily. The storage is also very adequate for a diaper bag big enough to contain the needs of two children, as well as some other stuff the parent may want to lug around like shopping bags, their own bags, among other things. The stroller also comes with a back pocket to hold immediate needs of the parent or the caregiver like a mobile phone, a small purse, and car or house keys. It also comes with cup holders for the parent and the two children, and then a child’s snack tray. Each stroller has a maximum capacity of 50 pounds per seat, and has a removable belly bar for older children. It also comes with a great warranty provision particularly when it comes to stroller wheels as the manufacturer has guaranteed lifetime repair or replacement of the stroller’s wheels. 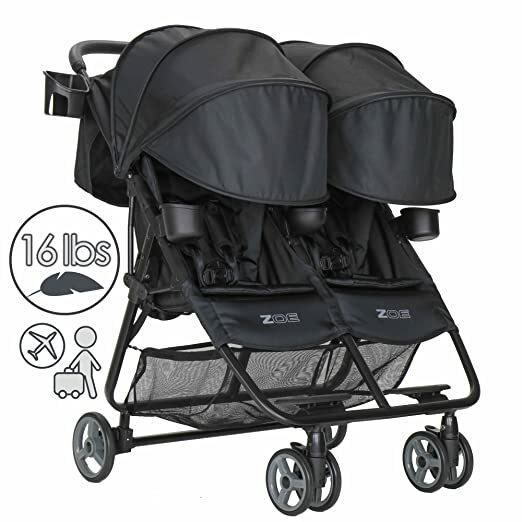 ZOE XL2 DELUXE Double Xtra Lightweight Twin Travel & Everyday Umbrella Stroller System has been known for being one of the lightest double strollers in the market today. Not only it is light, it can also be easily maneuvered through doors, making it easy for the parent to go from indoor to outdoor places minus the fuss. Apart from it being easy to set-up for first use, most owners rave about its no frills fold-up system that allows a one-step one hand fold – perfect for parents who already have their hands-full with two littles in tow. And because it folds up easily and does not take up too much space, it is the perfect stroller for air, sea and land travel. Airline travel will be a breeze, thanks to the convenient folding mechanisms and adequate storage it boasts off. Land travel is easy too because it folds and fits easily in the car. It is also very easy to use even on public transportation like subways, buses, trains, and even taxi cabs because it can be maneuvered easily, can be folded in a snap, and remains compact. It may be super lightweight, and convenience may be its major selling point, but this double stroller offers great comfort to babies and young children. The seats are wide enough to not restrain their movements, and are fully padded for their comfort. It also comes with a deep 135-degree independent reclining seats that can comfortably convey a sleeping baby or toddler, or even a younger child who weighs under 50-pounds. It also has a wide four-panel canopy that protects babies from sudden rain showers or snowfalls, as well as the harsh rays of he sun. There is also a magnetic peek-a-boo cover on the canopy so parents would be able to monitor the babies, without having to fully open the canopy. The stroller also comes with a back-pack style five-point harness system that comfortably secures the babies without the feeling of being too restrained. The ZOE XL2 DELUXE Double Xtra Lightweight Twin Travel & Everyday Umbrella Stroller is so easy to use such that parents will not have trouble lugging it around during travels, commute, errands, and even while strolling in the park. Apart from the individual cup holders, and the snack tray for the kids, this double stroller also provides a parent’s cup holder, a peeping magnetic cover in the canopy so that parents can check on the kids without disturbing them, and a pocket that can hold a parent’s essentials like keys, a small purse, and a mobile phone. It also has a wide storage basket that can accommodate a big diaper bag, plus some shopping bags. The belly bar and the cup holders can be removed too, so that it will be easy for younger kids to get in and out of the stroller when needed. This feature is definitely perfect especially for strolling in amusement parks and the like. Ultra-Light Weight. This 16-pound double stroller is so light that it can be carried with one hand, making it perfect for errands, travelling, and strolling. It is also very easy and light to maneuver. And though it is made of very light materials, this stroller is stable and durable, and it does not tip over easily. Super Convenient to use. It has a one-hand folding mechanism making folding up quick and easy! It is also super compact when folded! This means more space in the trunk, and smooth travels whether via land, air or sea. It will also not take too much space in your home if and when you decide to store it there. Great warranty provisions. The ZOE XL2 DELUXE Double Xtra Lightweight Twin Travel & Everyday Umbrella Stroller System comes with a lifetime guarantee on their stroller wheels! If the wheels get broken, they will either fix or replace it for free. No Straps to handle when folded up. Unlike most umbrella strollers, this double stroller does not come with shoulder straps that will make it easier for the parent or caregiver to lug it around when folded. Issues in having it stand up on its own when folded. Families who own this double stroller complained about having a hard time making the stroller stand on its own when folded. Of course this is important so the parent or caregiver can deal with other stuff before loading or storing it elsewhere. Apparently it can stand on its own, but you would have to lock the front wheels first. Some concerns on the harness. Some parents complained about the harness being too flimsy, or its release clip being too tight that even adults will have a hard time disengaging it. If you are looking for a lightweight double stroller then you should look no further because the ZOE XL2 DELUXE Double Xtra Lightweight Twin Travel & Everyday Umbrella Stroller System could be the best stroller model and brand for your family. Convenience-wise it is ultra-light, boast of a one-step fold system, and is very compact perfect for travelling and errands! It is also super easy to use and set up, and has a large under seat storage that comes in very handy for shopping trips. It is definitely a good buy!